Sound This Big is Pure Passion. But you don't have to pay $275K for Pure Sound. It takes a lot of passion...and knowledge to build speakers like this. 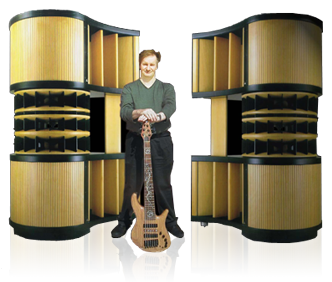 Scaled to size, the picture shows Phil's Air Pulse speakers: over 7ft tall, more than 1,200 lbs. per speaker and $275K per pair. 3D-like sound that has been heralded as "the best sounding speaker in the 100 year history of loudspeakers." The point? To take sound reproduction to another level. The irony is that Phil is ridiculously practical and wants to deliver the very best sounding and well-built products to everyone. You shouldn't have to be rich to enjoy Pure Sound. Live Sound. Studio Sound. Home Sound. Worship Sound. Phil Jones Pure Sound.